The raingardens on Howard Street intercept stormwater from the road and clean it before it enters our waterways. 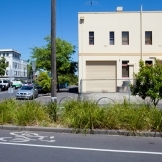 Howard Street is a short residential street in North Melbourne. 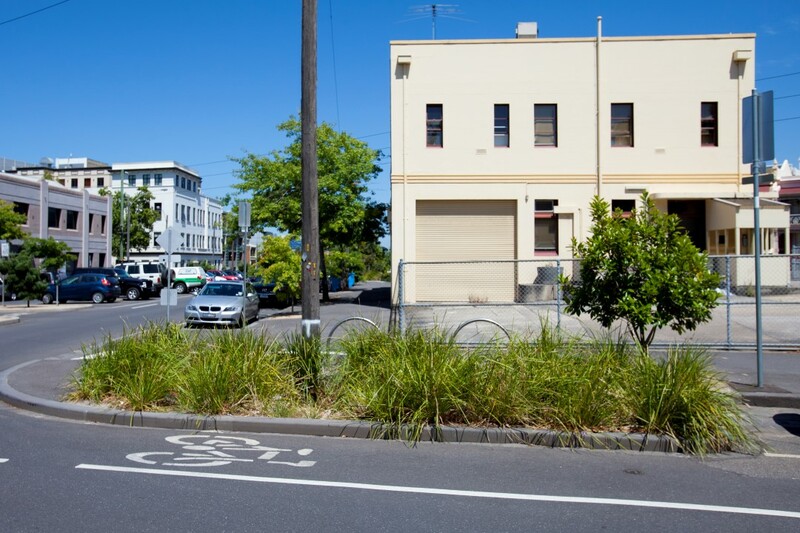 In 2011, the City of Melbourne closed part of the road and turned it into parkland. 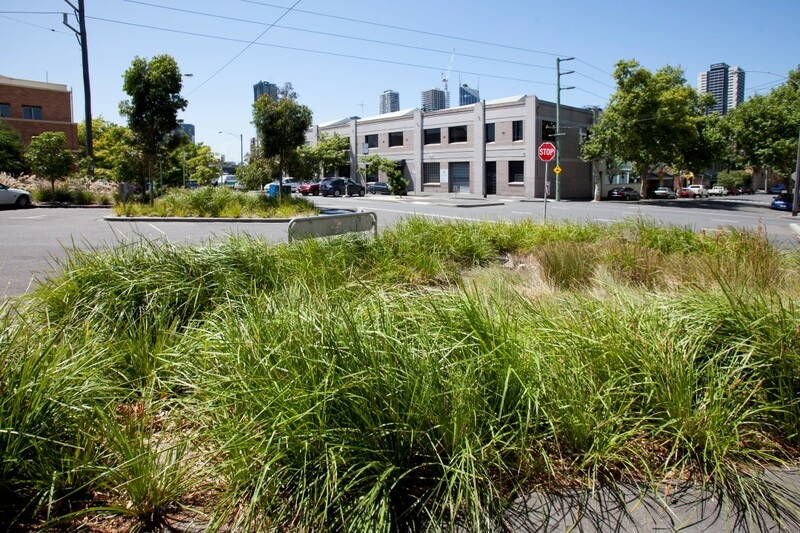 The new public open space includes three raingardens that capture and clean stormwater runoff. We placed two large raingardens at the intersection of Howard and Rosslyn Streets. They capture water running down the gutters on Howard Street, before it reaches the stormwater drains. 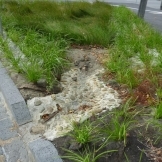 The third raingarden captures runoff from William Street. What benefits have the raingardens provided? Reduced the volume of stormwater entering our waterways. Reduced the levels of nitrogen and phosphorus entering the waterways. 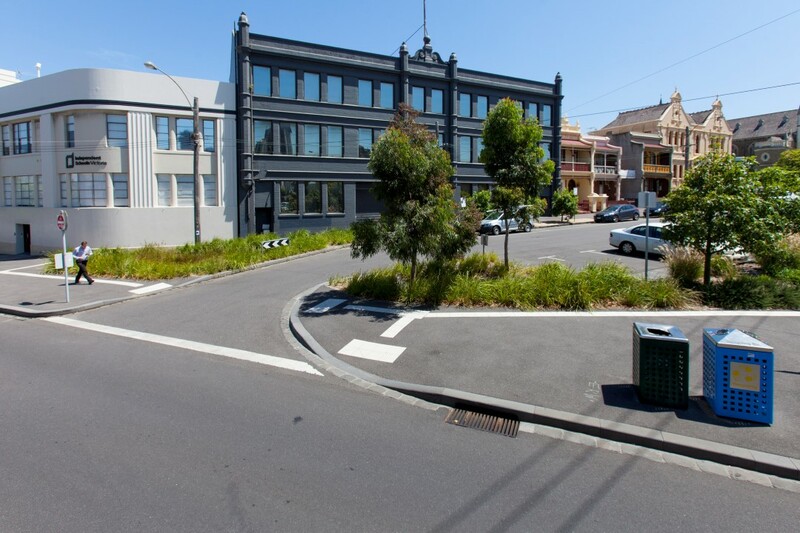 Created a greener streetscape that is better for people and the environment. Howard Street slopes down between William Street and Rosslyn Street. We built two new raingardens at the low end of Howard Street. When it rains, the gardens capture water running off the road before it enters the stormwater drains. The water pools in the garden beds and gradually soaks down through the sandy soil. The raingardens are planted with wetland grasses and look like standard garden beds. Beneath the surface they are made up of several layers of substrate. These are designed to remove litter and pollution from stormwater. The top layer is called the filter layer. It removes fine particles of pollution from the water and traps litter and debris on top. The middle layer is called the transition layer. It prevents the finer sands from being washed into the drains. The bottom layer is called the drainage layer. 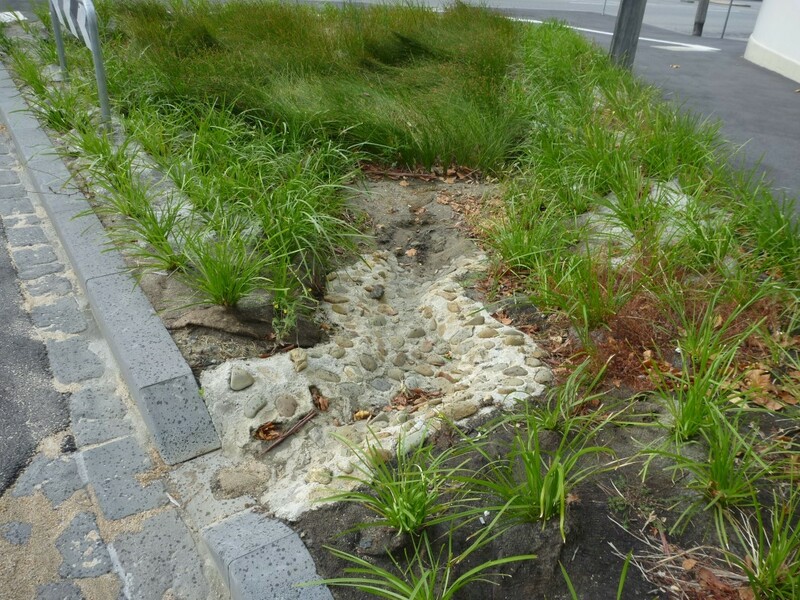 It allows the clean water to drain from the garden bed and back into the stormwater system, eventually flowing into the Yarra River. The raingardens in Howard Street were part of broader streetscape redevelopment that cost a total of $1.5 million. Because the redevelopment of Howard Street involved turning some of the street into parkland, we did a traffic study to understand the impact of such change. We also investigated traffic volumes prior to the design process to support the business case for closing part of the road. MUSIC modelling was carried out to help determine the size and location of the raingardens. To aid the community consultation, we developed concept designs. The designs were refined based on community feedback. This was the first time we used the Biofilta planting system, where mature plants are pre grown at the nursery in large format modules. The modules arrive on site with 100 mm of loamy sand thick with plant roots. We placed these close together in the raingardens, on top of 400 mm of filter layer sand. Plants are established from day one and do not need 6 – 12 months on site to mature. The system functions to its ability from day one as the mature plants can absorb the nutrients in the stormwater straight away. Establishment and maintenance costs are reduced, especially weeding and plant replacements. The design of the entry point is critical to the volume and speed of the water entering the raingardens. Initially, the water had too much speed running downhill along Howard Street to the entry of the larger, western raingarden. To counter this we installed a rocky apron to dissipate the water flow. 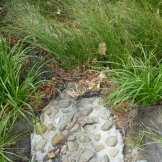 Some of the rocks were installed slightly too high, which stopped some of the water from entering the raingarden. We engaged extensively with the community about our plans to turn some of the underused section of Howard Street into parkland. In response to community feedback, we added the raingardens to the original park design. You can download the concept plan used for consultation at the top of the page. 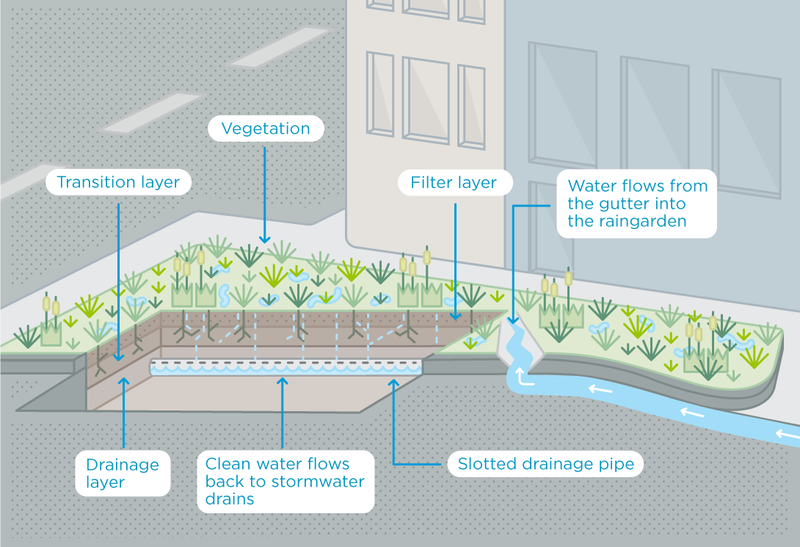 Each raingarden has four layers; the plant modules, a filtration layer, a transition layer and a drainage layer. Each of these are detailed below. Purpose: this is where all the work happens. This layer filters sediments and larger litter. Phosphorous is absorbed into the filter layer. Nitrogen is removed via the plant roots and soil bacteria that exist in the filter media. Composition: 80% Loamy Sand, 10% vermiculite and 10% perlite, by volume, evenly mixed. A layer of recycled rock aggregate is added to the top to protect the filtration layer. Two 90 mm slotted drainage pipes are set within the drainage layer to allow excess water to flow back into the stormwater network. The pipes have a riser that allows for the flush out of any accumulated sediments. The drainage pipes connect in to the overflow pits. This allows for easy inspection of their function during rain events. The Howard Street raingardens do not retain moisture during long dry periods. 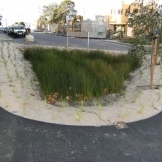 The inclusion of a submerged zone would reduce this impact as the water retained at the bottom of the raingarden keeps the sandy soil moist for longer periods. This is recommended in the Facility for Advancing Water Biofiltration (FAWB) Adoption Guidelines for Stormwater Biofiltration Systems. We have had to replant the raingardens, as extended dry periods have resulted in some plant losses. The plant modules are 500 mm x 500 mm x 100 mm deep with a well-established root matrix that holds together the sandy soil. These modules are installed like tiles close to one another across the level surface of the filter layer. 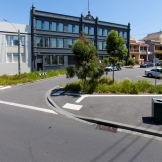 Density: six plants per square metre. 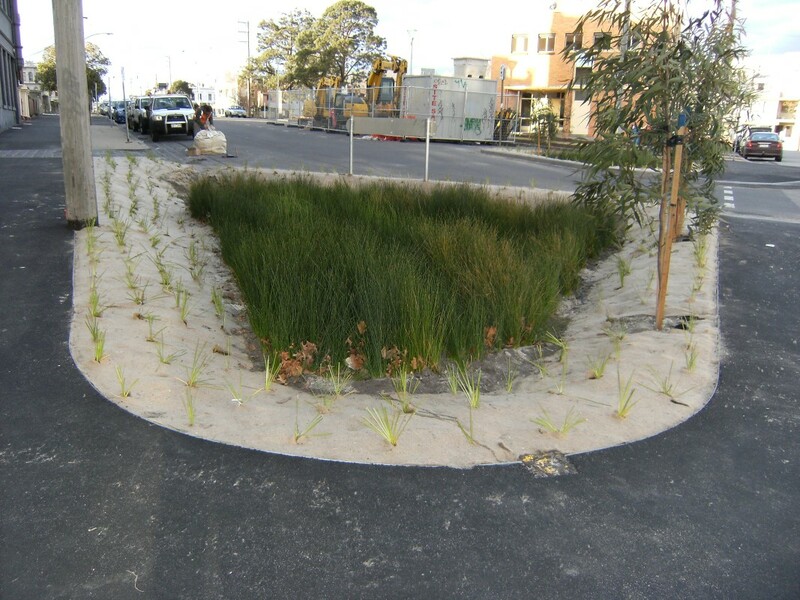 In addition to the grasses, the banks were planted with Lomandra longifolia and a tree was planted in one of the raingardens as a feature to tie it in to the surrounding landscape. The pre-grown plant modules make the system look well established from day one. Overflow pits have been installed 100 mm above the surface of the raingarden. 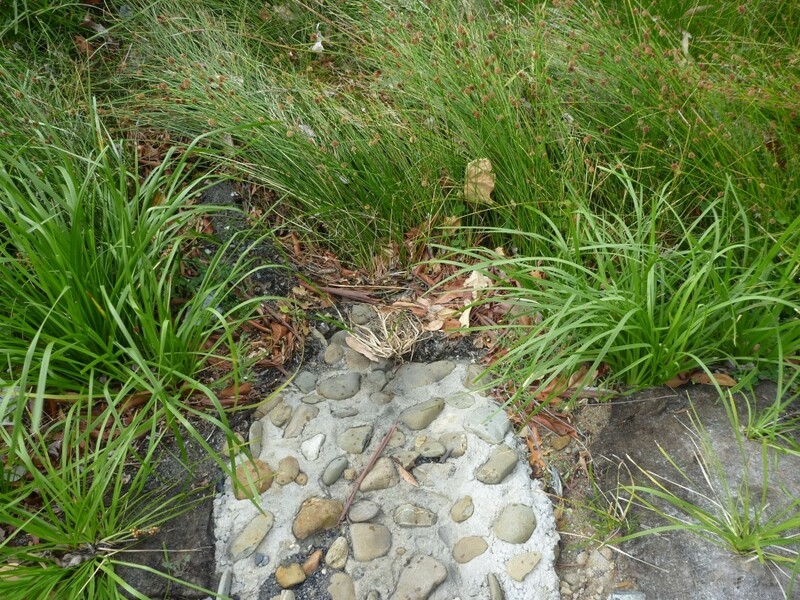 In heavy rain, excess water will bypass the raingarden and flow directly to the stormwater system. Monitoring detention time for filter media.